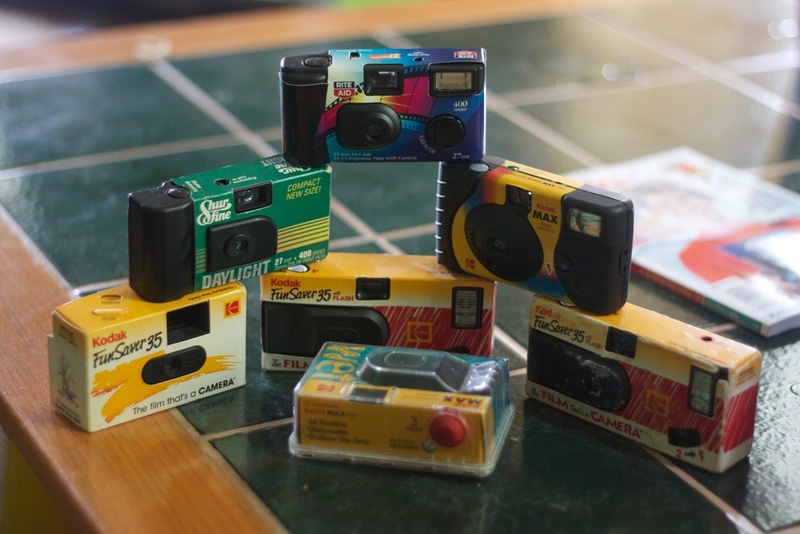 I've been going through some old boxes and came across a fairly mixed collection of old disposable cameras. Most were used, but had apparently never been developed. Little man discovered them sitting in basket. "Spy cameras!" Then a look of suspicion crossed his face. "Are you two spies?" We tried explaining that they were just old cameras, and that the bright yellow was probably not a very "under cover" kind of color. "Sure! This one has some pictures left on it." Stares in confusion at the back of the camera. "How do you turn it on?" "It's kind of always on, but you have to wind it." "A wind-up camera!?" His voice goes up several octaves, starting as his normal little-boy frequency and ending with the cat's rubbing their ears. I show him how to wind it, and hand it back. He holds it out about a foot in front of his face. "How do I aim it?" "You have to look through that little hole in the back." "No, you hold it up to your face." "Ohhhhh.... I don't see anything." "No you just look through the hole with one eye." "Ah hah! This camera's weird." "Now how do I see the picture?" Starts turning the camera over and over. "We have to take it to a place to have them make paper pictures for us." One eyebrow goes up. "Really?" "Yes. It's called 'developing.' They 'develop" the film that's in the camera so the picture on it becomes visible, then they'll copy it onto a bigger piece of paper for us." The eyebrow goes down, but the other one goes up. "REEEEALLY?" "Yes REALLY! This used to be the only way you could take pictures." "Oh," he says, then looks pensive. I think he's finally realizing what hardships his old man had to through in the olden days. After this we went out for a photo-walk with the three cameras that still had unexposed film. Heard several times on the walk: "There's only X pictures left. I'd better be careful about what I take pictures of." That's my boy. He got right the heart of the experience of photography in the 20th century. I don't miss those days. Now for the next lesson: waiting to see if any of the pictures came out. I'm also really curious to see what archival evidence might be preserved on these things. Hopefully there will be something to report... if we can find a place that still develops them.